“Man, those two guys are taking off fast”, I think to myself as I look at my watch to see we're running a 6:30 min/mile pace. We're about a half mile into the race, running with headlamps and flashlights after the 7:00am start a few minutes ago. It's dark and I'm following the fastest two runners. The three of us are ahead of the other roughly 150 runners that started the 50 mile and 50 kilometer races at the same time. I take a quick look back to take in the sea of blueish white lights bobbing up and down. I probably shouldn't be up here with the front runners and wonder how long I'll be able to hang with them. Six weeks ago I had a rappelling accident that resulted in a severely sprained ankle and a partially torn medial meniscus in my left knee. A little over a month ago I had surgery to remove the torn part of the meniscus. I'd run a mere 16 miles in the past 6 weeks but my competitive race attitude takes over and I'm out front running as if I'd trained for this race. Definitely it won't last but I figure I'll put some time in the bank and limp it in to the finish later if needed. Beautiful light and color on Friday evening. The running is great. The trail is smooth dirt passing through a desert environment. There are no big climbs but plenty of small rollers passing over hills or through creek drainages. The stars were out when I awoke at 5:00am but now we have a very nice cloud cover which, thankfully, would last most of the morning and only break about the time I finished the 50k race. The course is basically a figure eight with a large loop on top and smaller 6 mile loop on the bottom. 50 milers run the entire outside of the figure eight as one big loop four times. The 50k runners run the bottom loop of the figure eight once to start and then two of the big loops along with the 50 milers. Most often, the trail is paralleling the paved roads in the canyon so crew access is simple and frequent with the numerous aid stations. Because of the frequent aid stations, there's no need to carry more than a single hand bottle and some gels in this race. A pack would just be extra weight and extra heat on the runner's back later in the race when it gets hotter. I start the first, small loop with just a hand flashlight. I have a long-sleeved shirt over my sleeveless shirt and shorts on the bottom. Aggressive trail shoes are not necessary on the smooth trails either. I run in very basic trail shoes that are basically glorified road shoes (Saucony Excursion TR3s). The first aid station, at the middle of the two loops, is Phil's at 3.6 miles. I get there around 7:30am and by now it's light enough that I can ditch the flashlight there. It's also warm enough that I ditch my long sleeve shirt. I drop these items by a kiosk-like sign and head back 2.3 miles to the start/finish area to complete the first small loop at 7:50am. Allison hands me a hand bottle and my gel flask and I don't have to stop. At this point I'm in second place but it's way early in the race, 6 miles into it, and I'm sure that won't last considering my lack of training in the past 6 weeks. Again I'm at Phil's AS at mile 9.5 where Allison is again waiting for me. I quickly spray some sunscreen on and grab my visor and sunglasses. While I'm doing that, another 50k runner passes by and now I'm in third. So it begins now eh? My slide down the ranks. I'm used to this feeling, though, as I often go out too hard and slowly lose places but this is still early in the race. But I'm OK with that...I'm soley focused on my goal time of “around 5 hours” and also assessing how my knee and ankle are feeling as I go. So far, they've both treated me well in the race and I'm pleased with that. After leaving Phil's and embarking on the large loop for the first time, I'm quickly impressed with the landscape. This part of the course heads deeper into the backcountry of the canyon leaving the sounds of the paved road behind. Small pinnacles and little sandstone towers rise up on top of the red-dirt foundation mesas. It reminds me of the Grand Canyon on a much smaller scale. The leaves on a few of the trees are changing yellow. The clouds overhead keep things cool and pleasant which is a good thing since there is virtually no opportunity for shade out here. After close to 2.6 miles, I pass through the remote Dos Loco Senioritas aid station—a station run by two self-proclaimed crazy ladies. They are making enough encouraging yells and claps that I could hear them from a mile away. It was awesome. With my hand bottle and gel, I'm well-stocked and don't need to stop at the aid station and just wave as I pass through. 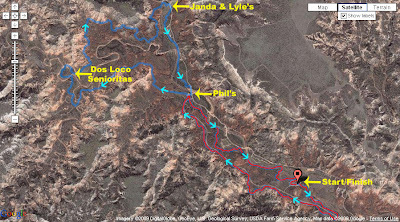 The next section of the course is very scenic passing through and around brightly-colored dirt and sandstone to the Janda and Lyle's aid station 2.7 miles from the Dos Loco Senioritas aid station. Allison was again waiting for me at Janda and Lyle's because this one is on the paved road just a little over a mile from Phil's aid station. I don't need anything from Allison here and again keep moving through the aid station. I run on the trail along the road from Janda's to Phil's and switch out hand bottles with Allison at Phil's. Af ter a short, scenic bit of running from Phil's to the start/finish area, I've completed the first of two big loops, along with the initial small loop, in 2 hours, 45 minutes. Allison tells me I'm in fifth place at this point. I knew that, though, as I had been counting the runners that pass me. I start the second, and final, big loop and chat briefly the fourth place runner ahead of me. We're both thankful for the high clouds that are still keeping things cool. I pass through Phil's again to change out my hand bottle and gel bottle with Allison. I'm starting to feel the effects of running pretty fast with no training and tell Allison I'm likely to slow down and be later than expected at the remaining aid stations. My groin muscles are starting to feel very sore and tight , my calf muscles are tightening up and my right knee is a bit sore, probably from involuntarily favoring my right leg to protect my left leg joints a bit. However my energy level is strong and running at this relatively low altitude is resulting in plenty of oxygen. I end up walking up the small hills and tiny climbs mainly to change my stride a bit to work the muscles a bit differently. Occasionally I stop to stretch my legs and groin muscles. The leg pain is starting to be more constant and steals my focus from running and enjoying the scenery. But pain is a fine indicator that we are alive and I do my best to welcome it. It's not unexpected and it's not terrible. I stop briefly at the Dos Loco aid station to refill my hand bottle half way and to take another electrolyte tablet. I've been on a schedule of taking an electrolyte tablet and a big shot of gel from my flask about every 30 minutes. On the trail again I pass a couple of 50 mile runners and look back to see another runner coming up fast. At this point, the 50k and 50 mile runners are all interspersed but the 50 milers are, expectedly, taking it a bit slower than us 50k runners. When I see a runner coming up on me, I know it's another 50k runner. I stop to pee and let the runner by. Just outside of the Janda aid station again, I get passed by one more 50k runner. I think I'm in 7th place now but have lost track. Also, I realize I won't be able to finish under 5 hours. I pass through Janda again without stopping and say hello to Allison and tell her I'd like a half-full water bottle at Phil's. It's a slow, lonely jog for me from Janda to Phil's. I see no one else and don't hear the cars passing by. At Phil's for the last time Allison gives me the half full water bottle and asks when I finish. I tell her it will be about 10 minutes after noon, 5 hours and 10 minutes for the run. I can smell the barn now, so to speak, and want to run faster but my legs won't have anything of it. I can run but not much faster than 10 minute miles. I do what I can, passing a few 50 milers when, about a mile from the finish, I see another runner coming up on me. She passes me with an encouraging word, “we're almost there!”. I know it and I'm excited. I get my pace just under 10 minute miles and hold it as long as I can which is almost to the finish line. The finish area is full of runners and families and the cheering gets me excited and I step up my pace to the finish at 5:09:15. I receive my finisher's hat and find Allison so I can go lay down in the shade somewhere and stretch out my limbs. Both legs hurt all over and I can barely lower myself to the ground. My lower back is sore, my shoulders are sore from too much tensing (something I frequently do with my shoulders) and, oddly, my left bicep is quite sore. I'm not upset about the pain and, in fact, I relish in it. It feels great to be feeling this wasted again. Six weeks ago while I sat in the emergency room after my rappelling accident I was sure I wouldn't be trail running again until early 2010 at best. I far exceeded my expectations and ran stronger than I could have hoped. 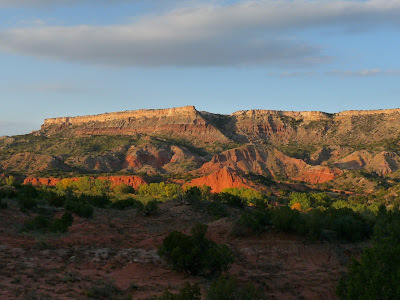 The Palo Duro trail race is a very good race and one that I would recommend and hope to run again. There's a 20k “fun run”, the 50k and the 50 mile. I'm not sure I'd run the 50 miler on account of it running the big loop four times and getting very hot in the afternoon with no shade but the other, shorter distances would be good fun. The camping in the canyon is very nice including hot showers at the campgrounds. The race staff were quite friendly and the runs were well organized.